And so to the Eternal City. Rome is a city of grandeur past. A similar claim can be made of Roma, currently making stuttering progress under Luciano Spalletti. The Juventus monopoly over Serie A will not be an eternal one, but their empire is utterly dominant for the moment. Last month, as part of my Italian grand tour, I went to see Roma – Inter. Setting out from the apartment, I crossed Piazza del Popolo on my way to get a tram to the Olympico stadium. As I approached the tram, a young Chinese guy approached me. “Excuse me mate, is this the tram to get to the football stadium? Where do I buy a ticket?” he asked. In a thick cockney accent. I was as impressed by his English as I was disoriented by it. I was able to confirm that this was indeed the tram but unable to enlighten him on buying a ticket as I had purchased one at a kiosk earlier. I advised him just to get on and see if he could get a ticket aboard. Of course, as expected, the tram was so packed that any ticketing procedures were rendered redundant. For the second week in a row the game I was going to kicked off at 8:45 pm on a Sunday evening and thus I was alone and not with my young son as I had hoped to be. Security at Italian games has been increased significantly and I would feel entirely comfortable taking a 6 year old to a Serie A game. Having made it to the stadium and through the myriad security, I took my seat behind the goal in the Curva Nord. Having paid a premium the previous week for a covered seat at Fiorentina, this time I had one of the cheapest tickets available for the game. And it was a better seat than the one I had occupied in Florence. Opposite me, behind the far goal, was the Curva Sud, home to Roma’s (in)famous ultras. Or at least some of them. One of the new security measures at the stadium is a barrier splitting the Curva in half and its installation has prompted mass protests and boycotts among the ultras. They had turned out in reasonable force for the visit of Inter but there were enough gaps to indicate that some ultra-boycotters are yet to be placated. Usain Bolt, with characteristic modesty, offered birthday wishes “from one legend to another.” Bolt is reportedly going to be training with Borussia Dortmund (most likely a sponsorship stunt since both he and the German club are sponsored by Puma) and has expressed a desire to play for Manchester United. Mourinho’s side do currently lack pace at the moment. Speed of foot has never been one of Totti’s greatest attributes, but his remains one of the quickest minds on the pitch. Sadly on this occasion, the Italian master only took to the pitch for the warm-up before remaining an unused substitute. The crowd paid their own tribute with a prolonged chant of “uno capitano,” one of the few that I was able to follow and participate in with my limited grasp of Italian. Five minutes in and it was uno – nil to Roma; Dzeko providing the fitting conclusion to a fast break down the right with a crisply clipped finish into the far corner. The fact that this was a big game was reinforced by the sight of Spalletti in a suit. The Roma boss is more commonly attired more comfortably in a tracksuit but clearly felt that this was an occasion that warranted his Sunday best. Also interestingly attired were the Argentinian couple sat next to me. One wore a Boca Juniors shirt while the other sported a River Plate top. This display of unity was in keeping with the overall atmosphere in the ground, which was passionate but mercifully lacking in much of the vitriolic excess I’ve witnessed at Serie A games in the past. One observation that I noted down during the game was that Inter looked a lot better than their Milanese neighbours had the previous week in Florence. Milan were dull and utterly lacking in inspiration against Fiorentina. Inter were behind against Roma but playing with patient fluidity. Subsequent results – and the sacking of Inter coach Frank de Boer – indicate the challenge of making judgements based on a single performance. Inter were impressive that night though and contributed significantly to a very fine game of football. Roma were content to concede possession and ground to the visitors while focusing on breaking at great pace when they won the ball back. Salah was central to this tactic and several times found himself in excellent positions to increase his side’s lead but succeeded only in producing a series of erratic finishes. With half time approaching it struck me that I hadn’t heard a single flare be let off. The last time I visited the Olympico (for Roma – Juventus in 2010) a flare exploded roughly every ten minutes, provoking a half jumping, half cowering motion from me on each occasion. 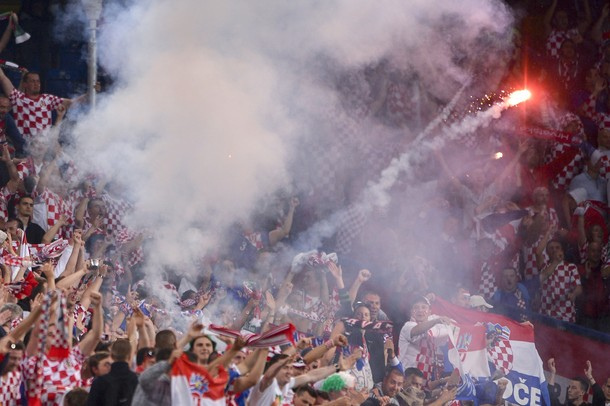 Those around me at that game, much more used to the pyrotechnics than I, watched with some amusement. Always worth watching is Daniele De Rossi, and once again he did not disappoint. He finds pockets of space and is able to play passes at the subtlest of angles, both in ways reminiscent of the great Xavi. He makes Roma tick and was the one who provided the platform for the majority of their most enterprising moves. One slightly unusual feature of the game was Inter’s insistence on taking every corner as a short corner. I’ve never been much convinced by the short corner except on those rare occasions when it’s taken very quickly before the defending team has had a chance to organise itself. When that’s not the case, the short corner is designed to create a better angle for crossing the ball but how often does it result in possession being squandered or in a sequence of passes that mark a retreat back as far as the halfway line? Inter’s succession of short corners didn’t produce a single noteworthy chance. If the definition of madness is doing the same thing over and over again and expecting a different result, this was a mad way to proceed. At half time the score, incredibly given the opportunities created at either end, remained 1-0. Both teams were acquitting themselves well, with clearly defined patterns of play, yet it was obvious that neither side had the confidence to go on the sort of run that would cause genuine alarm in Turin. These were two sides in transition; works in progress. Whether either turns out to be a masterpiece remains to be seen. Serie A as a whole is not in rude health but on the evidence that I saw in two games, it is still much better than its detractors would have you believe. The essence of the Italian game – technical ability, tactical sophistication, and a sense of theatre – remains intact. The biggest global stars mostly play elsewhere these days: in Spain, England and Germany. But like empires, footballing powers rise, wane and fall. Italy’s time will come again. Football culture varies from country to country (and that’s one of the reasons I love going to games when I travel) but some aspects of the beautiful game are universal. It’s remarkable the extent to which crowds applaud the same things everywhere – a committed tackle, an earnest attempt on goal however wayward, a defender obstructing a forward in letting the ball run out for a goal kick. After 71 minutes, the Inter supporters were applauding an equaliser; Banega cutting through the Roma defence to drill a low shot in at the near post. It was a fine and deserved leveller and it would have been easy for panic to set in among Roma’s players. But instead they found fortitude and resolve. And just four minutes later they found themselves back ahead; Manolas stooping to steer home a header from a free kick. It was the cue for bedlam in both Curvas. The rest of the story, as told from the Curva Nord, can only be described as tense. Both teams created further chances but the scoreboard was not further altered. I spent the last minutes stood at the top of the stairs as Inter forced several late corners. Many Roman prayers were offered in search of the final whistle. The ref kept the whistle in his mouth but silent. Time ticked on at the cruel, excruciatingly slow pace that it reserves for such moments. And panicked a little. Breaths started to be held for periods that were damaging to health. “Kick it anywhere son.” I think that’s what they were saying. They spoke to me in Italian and I did not understand the words but I understood. Men gripped each other’s shoulders. Then it was done; and the sweet, sublime relief. The puffing out of cheeks. Hands raised. Faces of joy, slightly dazed. Victory is appreciated when it’s hard earned. I ran with the crowds for the tram. After a reasonable wait, one arrived. The scramble aboard began, the scary surge of a mass of bodies entering a confined space. The surge continued after I made it through the door. You cannot plant your feet in such circumstances, only wait for the wave to subside. But on it went, relentless and dangerous. Breath was no longer held but it was restricted. Limbs contorted into shrinking spaces. It felt like the world’s worst game of Twister; played upright. We were packed like that for twenty minutes, all the way back to Piazza del Popolo where we emerged into the late night: relieved and victorious, taking deep breaths. This is the first part of a tale of two matches. I was recently in Italy on holiday taking in the delights of Florence, Norcia, and Rome. The original intention had been to visit those places in reverse order but that was before the Serie A fixture list was published. Had the original plan been adhered to then I would have been able to see Lazio v Empoli in Rome. Changing the plan (with the kind agreement of my ever wonderful wife) meant that I could see Fiorentina v AC Milan in Florence, followed a week later by Roma v Inter Milan in the capital. I may have mentioned before that I have something of a soft spot for Italian football. Fiorentina’s Stadio Artemio Franchi offers covered seats along only one side of the ground. Thus a dilemma: pay more for a covered seat in the event of it raining or take my chances with a cheaper one that would leave me exposed to the elements? Conditioned by living in the Tropics, I opted to guard against the elements and thus forked out €65 for a seat beneath the roof. Or at least I tried to. My command of Italian is limited and yet it wasn’t this that prevented me from concluding an online purchase. The website wanted Italian ID details which, not being Italian, I didn’t have. No problemo (as the Italians say), I sent an email to the ticket office. Impressively swiftly they responded with a form for me to fill out. I completed the form and returned it. About five times. Each time they sent it back with some new stipulation or request for information that was apparently vital to my obtaining a ticket. After about 36 hours of back and forth, I had a ticket in my inbox. By contrast the purchase of a Roma ticket online was entirely straightforward. Security appears to have been tightened at Italian football matches since I last attended one back in 2010. My ticket and ID were scanned and checked several times prior to actually going through the turnstile and entering the stadium. It was an hour before kick-off. I generally like to get to games early and savour the build-up. A few days earlier I’d read an article by Paul Scholes in which he said that he was becoming increasingly disillusioned by ‘big football’ (by which he was primarily referencing the English Premier League) and preferred watching Salford games, the semi-professional club that he part owns. Italian football is no longer quite the glorious spectacle that I first fell in love with in the ‘90s but Fiorentina v AC Milan still qualifies as a pretty ‘big’ game. I support neither side but was still excited to be at a big game, more excitement than I would have felt at Lazio v Empoli for instance. There’s nothing quite like that feeling of going to a big game, especially one under the lights. Floodlights do remarkable things to football grounds, they charge the whole atmosphere. I know what Scholes means though, and a ‘big game’ can be defined as any game that really means something to those watching, and hopefully to those taking part. Thus there are big games at all levels of the footballing pyramid and I think the point that the ex-Manchester United star was making is that the experience should be an authentic one. Before the big game kicked off I noticed several small boys playing with a ball at the edge of the vast stand behind the goal to my left. Theirs was the sheer exuberant joy of kicking a ball around, as multi-millionaire superstars warmed up on the pitch just a few metres away. A few seats along from me were a couple of students (somehow, wherever you are in the world, it’s always easy to spot students) with ‘Forza Viola’ painted on their arms. It seemed a strange way to display your colours but perhaps purple isn’t the easiest for some to work with. I had paid to be dry so of course it was a warm cloudless night with not so much as a hint of rain. I could’ve had a much better and cheaper seat on the opposite side of the ground but insurance comes at a price. So does refreshment at football stadiums these days, but I was pleased to be able to refresh myself with some Peroni, served in a plastic cup at a cost of €4.50. It remains a great pity that the sale of alcohol continues to be banned in British football and I’m not convinced the restriction contributes much to orderliness since many people just increase their consumption prior to the game. The guy sat in front of me appeared to be whiling away the time before kick-off on Tinder. At least I assume it was Tinder; as a happily married man I have never visited this online revolution in dating (if that’s not rather a quaint term for the object of Tinder) but from the procession of young ladies across the screen, this is what I took it to be. He swiped in a rather disinterested fashion, in a similar way that people often peruse the matchday programme and its list of official sponsors. Behind the goal, where the ultras were situated, more passion was being displayed alongside a flag that read: ‘Panico Totale.’ It wasn’t clear if this was an invitation to the away fans or an admission of suffering on the part of the home ones. The game began with Fiorentina thoroughly dominant but unable to create anything that could be described as a clear-cut opportunity. Until the 22nd minute, when they were awarded a penalty. Ilicic’s penalty struck the post. “Mama mia” indeed. A despondent lull settled on the game for a while after that. Milan continued to offer next to nothing and Fiorentina probed rather half-heartedly save for the occasional incisive break. The fans did their best to rally greater industry but they too seemed to tire of the effort rather easily. What you cannot fault Italian fans for is their sense of style. There are not so many replica tops on display in the crowds at Italian games. Supporters (both men and women) know how to dress and see no reason why fashion should be jettisoned at the football. It helps of course that Italians are instinctively stylish people. For some British supporters, putting on the team strip is probably the closest they’ll come to making a fashion statement in any given week. It was proving a relatively straightforward game for the officials; all five of them. I simply do not understand the role or point of the fourth and fifth officials. They are clearly an invention of the referees’ union and serve no discernible purpose nor make any meaningful contribution to the game. They always seem slightly embarrassed of their position. Imagine an employee in Starbucks whose only job is to write the names on the cups: that’s the fourth and fifth officials. The second half had a higher tempo and Milan even ventured into the occasional attacking position. As the game progressed it opened up and was actually becoming a pretty decent 0-0. Both goalkeepers were called upon to exert themselves at regular intervals. Into the final stages and Milan had clearly settled for what they had and they sought to disrupt the flow of the game as much as possible, including with substitutions. Each one brought about the always absurd spectacle of the ‘jog walk off’ whereby a player attempts to leave the pitch as slowly as possible whilst trying to convey a slight impression of running. The effect is something like a reverse moonwalk, but lacking all grace and poise. I think all those who do the ‘jog walk off’ should be felled by the referee and placed on a stretcher. Maybe that’s a job for the helpful fourth and fifth assistants behind the goal. Milan held on and the game finished 0-0, the only scoreless fixture in Serie A that weekend. I wonder if the guy on Tinder’s night remained scoreless thereafter.